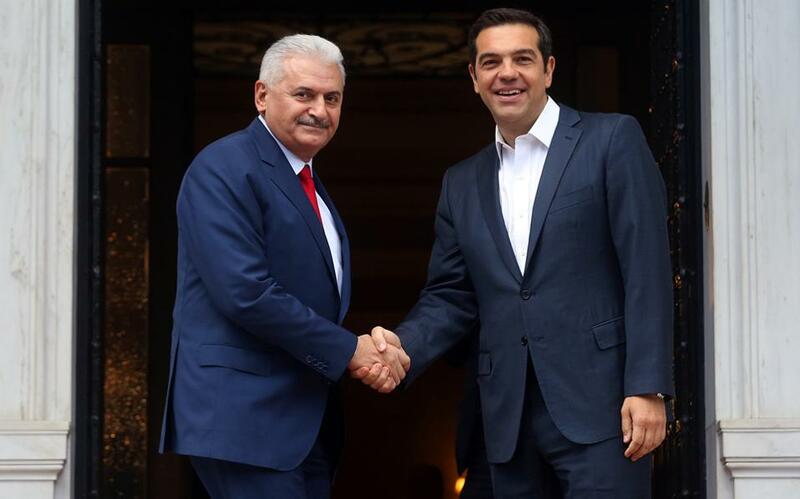 Relations of trust and cooperation can only benefit Greece and Turkey, said Prime Minister Alexis Tsipras on Monday, welcoming his Turkish counterpart Minister Binali Yildirim in Athens. “The relations of trust and cooperation between Greece and Turkey could benefit the peoples of both countries,” Tsipras said, adding that people should support their neighbors in hard times, something that both countries faced in the past year. “I look forward to the opportunity to face challenges in a constructive way in order to provide solutions, I am looking forward to the opportunity to approach the issues in a positive way,” the Greek prime minister said. “We are neighbors, we share the same fate and we have to face the matters with calmness,” said the Turkish prime minister. He also said there should be a positive way of dealing with issues without prejudice or misunderstandings. “We have a saying in Turkish, that the neighbor even needs the ash of the wood his neighbor is burning. We need each other and we depend on each other on everything,” Yildirim said.